The diet of the population of Papua New Guinea (PNG) is often inadequate in minerals, carotenoids and vitamins because of low intake of fruits and vegetables. Further, the bulk of food intake by PNG population is staple food crops most of which are rich in calories but deficient in minerals and vitamins, leading to several malnutritional disorders. To rectify this situation, growing and consuming vegetable crops that contain higher concentrations of mineral nutrients (Fe, Zn, Ca etc. ), vitamins andante-oxidants is necessary. 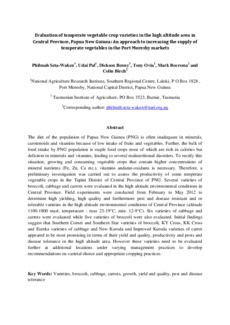 Therefore, a preliminary investigation was carried out to assess the productivity of some temperate vegetable crops in the Tapini District of Central Province of PNG. Several varieties of broccoli, cabbage and carrots were evaluated in the high altitude environmental conditions in Central Province. Field experiments were conducted from February to May 2012 to determine high yielding, high quality and furthermore pest and disease resistant and or tolerable varieties in the high altitude environmental conditions of Central Province (altitude 1100-1800 masl, temperature - max 23-19°C, min. 12-9°C). Six varieties of cabbage and carrots were evaluated while five varieties of broccoli were also evaluated. Initial findings suggest that Southern Comet and Southern Star varieties of broccoli, KY Cross, KK Cross and Eureka varieties of cabbage and New Kuroda and Improved Kuroda varieties of carrot appeared to be most promising in terms of their yield and quality, productivity and pests and disease tolerance in the high altitude area. However these varieties need to be evaluated further at additional locations under varying management practices to develop recommendations on varietal choice and appropriate cropping practices.